Unexpected life events like a job loss or a medical event can make your financial burden unmanageable. When you’re feeling overwhelmed with debt, our personal bankruptcy attorneys in greater Cincinnati and Northern Kentucky can help you get immediate relief from creditors. Bankruptcy can help you stop creditors and restructure your finances in order to get a fresh start. You can discharge debts, get caught up on overdue payments and get the clean start that you deserve. Our experienced Cincinnati and Northern Kentucky bankruptcy attorneys can help you understand the implications of a bankruptcy filing. Our experienced professionals can help you structure your bankruptcy in a way that’s calculated to provide you with the maximum benefit available under the law. If creditors bring lawsuits against you or garnish your wages, your financial issues won’t disappear unless you take action. When you file for bankruptcy, you stop creditors in their tracks. After you submit your initial filings, creditors may not contact you or take any action to collect a debt. When you file for bankruptcy, a bankruptcy trustee is appointed to your case. They determine what’s fair for you to pay to your creditors. A bankruptcy proceeding stops creditor phone calls, letters and other harassment that can be so frustrating when you get behind financially. When you work with our experienced Northern Kentucky and Greater Cincinnati bankruptcy attorneys, our legal professionals take swift action to stop creditors and help you restructure your finances. Even if you are facing immediate actions like foreclosure, repossession, wage garnishment or levies on your bank account, Lawrence & Associates can take immediate steps to stop the action and protect the assets that matter to you most. The best option is to contact our professional team as soon as you start to feel out of control. Our bankruptcy lawyers can help you determine if it’s the right time to file for bankruptcy. We can explore how the law applies to your situation and what you can expect if you choose to go forward with a bankruptcy proceeding. Send us a message using our live chat feature or call us at (513) 351-5997 to talk to a team member. Do I Qualify For Bankruptcy in Cincinnati or Northern Kentucky? There are two types of personal bankruptcy – Chapter 7 bankruptcy and Chapter 13 bankruptcy. Both types of bankruptcy can be helpful to stop creditors, discharge debts and become current on payments for big-ticket items like your home and your car. When you feel overwhelmed with debt, you likely qualify for either Chapter 7 or Chapter 13 bankruptcy. If you make below the median income in your state, you may qualify for Chapter 7 bankruptcy. If you make more than the state median income, you’re current on your taxes, and you can make at least some payments on your debts, you may qualify to file a Chapter 13 bankruptcy. There are advantages to each type of bankruptcy filing. Both Chapter 7 and Chapter 13 proceedings can help you wipe bad debts clean and restructure your finances. If you have a previous bankruptcy filing, there is a waiting period that applies. Our experienced Cincinnati bankruptcy lawyer and Northern Kentucky bankruptcy lawyers can help you determine which option is best for you. You might worry that if you file for bankruptcy, you must give up personal items that are important to you like your home or your personal effects. Fortunately, there are essential exemptions in the bankruptcy laws that allow you to keep the things that matter to you most. When you file for bankruptcy, you can claim exemptions under the law to the statutory maximum. In Kentucky, the bankruptcy exemption levels change nearly every year. The experienced bankruptcy attorneys with Lawrence & Associates follow these changes closely and can help you take advantage of your right to claim exemptions. How you structure your finances can have a significant impact in your reservation of bankruptcy exemptions. The best time to speak with a bankruptcy attorney is before you file for bankruptcy. 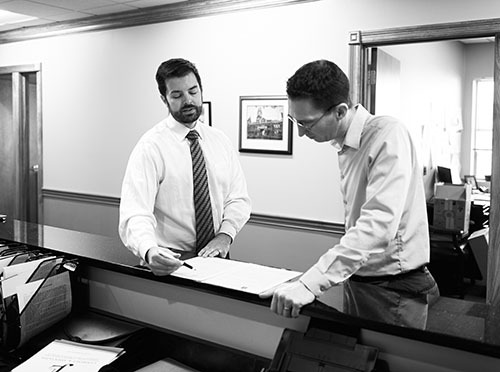 Our attorneys can help you structure your finances in a way that allows you to claim the maximum exemptions that are available to you under state law. There are some types of debts that don’t qualify for bankruptcy discharge. If you have student loans, alimony payments or child support liabilities, you cannot dispose of them through a bankruptcy proceeding. However, you can use a bankruptcy filing to address other debts to make it easier to meet your obligations. Bankruptcy can work to help you consolidate your debts into a manageable monthly payment that fits within your income and your budget. Filing for bankruptcy in Cincinnati and Nothern Kentucky means filing paperwork that lists your debts, your assets, and your income. The court must have the information that it needs to verify your eligibility for the type of bankruptcy that you’re filing. The court appoints a trustee to oversee your filing. Creditors have the opportunity to meet and verify the information in your case. When the trustee is satisfied, the court issues an order discharging your debts. If you file a Chapter 13 bankruptcy, you make payments on your debts for a period of time. The court determines a manageable monthly payment considering your income and your reasonable expenses. You make payments for a number of months. In your payment, you can include amounts that can help you become current on overdue payments like your mortgage. After a Chapter 13 or Chapter 7 bankruptcy is finalized, qualifying debts are wiped clean. When debts are discharged properly under a finalized bankruptcy proceeding, no creditor can again try to collect the amounts erased. Bankruptcy is about finding solutions. When you’re overwhelmed by your debts, bankruptcy can be the answer. It is a helpful and lawful way to get a fresh start when your obligations are too much based on your income. The steps that you take before and during your bankruptcy proceeding can have a significant impact on the outcome of your case. The bankruptcy process can take several months to complete. If you make monthly payments under a Chapter 13 filing, the entire process may take a few years with structured monthly payments. However, in all cases, as soon as you file, collection efforts stop. In bankruptcy proceedings, you have the right to eliminate debts that are dischargeable under the law and restructure other debts to become current on monthly payments for important assets like your home. If you are facing financial challenges that seem insurmountable, contact Lawrence & Associates for the help you need. Having experienced attorneys working on your behalf can help you ensure that you avoid errors that can complicate or even frustrate your bankruptcy filing. Our respectful attorneys work to help each client reach the best possible result from their bankruptcy proceeding. We work to help you identify ways that you can best structure your filing to reach your objectives. Our professionals help you use bankruptcy proceedings to your advantage, stop creditors from harrassing you, and rebuild your life. If you’re ready to begin, call us at (513) 351-5997 or message us right now using our convenient messaging app.